Search engines: Are you in? More and more business owners are becoming increasingly aware of the importance of the online media and are getting themselves familiar to different means of increasing their revenue through this space. However, the game doesn’t end here. It has also become very important to understand how the online space is functional in terms of making your sites easily visible to your potential customers. This is essential if you really generate significant amount of revenues and want to earn a good return of your hard-earned money that you have invested in developing the web site. Just developing a web site and floating it online is not enough, you also need to submit it to the search engines to better your chances of doing a good business. 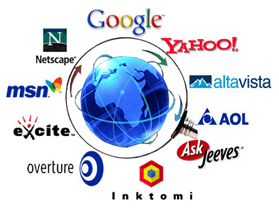 Different types of search engines are available online that help you to search the term that you are looking for. Now, let’s say, you are involved in the business of selling specialized oriental style ethnic handicrafts and want to reach out to your customers. A potential customer who is looking out for the kind of stuff sold by you will go to these search engines and search a term like “ethnic handicrafts” or just “handicrafts”. If your web site is not submitted to that search engine, then your potential customer won’t find your web site in that list which will be offered by the search engine. This might finally lead to the loss of your potential business from that customer. As a result, it has become very much important to figure in all the search engine lists. Not only this, there are specialized agencies available in the online space that do Search Engine Marketing for a business owner like you. These agencies have the expertise of developing the right advertisements for you and then placing those ads in the relevant areas. This term of putting the right ads at the right place is called “Placement”. Thus, by ensuring that your ad is placed correctly, these agencies can play an important role in getting better revenues and ensuring the best possible return on your investments. There are certain additional mechanisms by which these search engines work and it helps to hire such agencies who keep themselves abreast with the latest changes and advances of this complex search engine business. They work for a certain amount of fees or they might charge on a percentage basis depending on the percentage of the successful leads they are able to generate for your business. You might even think of submitting your web site directly to the search engines through your developer or the web maintenance person. However, if the web site is not designed in the right manner or the web pages are not properly arranged with the right key words, then the web site might still not figure on the top pages of these search engines. Therefore, it s prudent to be involved with such expert agencies initially on a minor assignment and once the mutual confidence is built up, you can then enter for a long term contract.